At this years Military Odyssey we chose to honour RT Idaho, a recon team with one of the longest and most illustrious history. 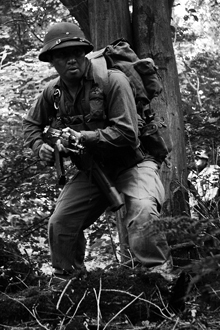 Formed in 1966 as ST Idaho (the ST stands for Spike Team) it went on to serve through all of SOG's active years until being disbanded in 1971 and was based out of CCN (that was known as FOB 4 when founded) at Da Nang, in the shadow of Marble Mountain. The list of team members includes SOG legends such as Ted Braden, Jim Hetrick, Robert Parks, John Meyer, Lynne Black, Doug Le Tourneau, Frank Pulley and Ken Bowra. 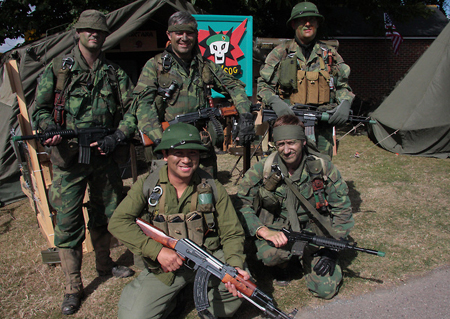 We chose to portray	a	late	war SOG loadout featuring modified ERDL uniforms, there is much debate of these being used "Over The Fence" by SOG but evidence does suggest they were used by Ken Bowra when he was with RT Idaho in 1971. 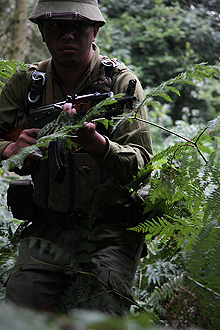 With the ERDL uniforms came innovations such as "No allergies" and "blood group" name tapes, as seen on cuurent US uniforms and well as tendency for teams to run "heavy" and carry more weaponry. We start withal review by General Westmoreland and then have chosen to show two missions, the first we were have assumed the team was shot-out and the second mission into the same AO has our 1-1 being injured, a too common occurrence at this stage in the war.